Effective global information access is more critical now than ever before. The digital world where users have diverse languages and diverse cultural backgrounds is increasing more rapidly than at any other time in history. This chapter addresses the cause of ineffective international information access from the standpoint of the user as well as from an information and system perspectives. 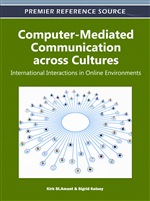 The chapter also describes the traditional and emerging approaches to enhancing global information access and proposes a system that shows how emerging approaches can minimize cultural differences. Seeking information is a common and an essential human behavior. Every day, we engage in the use of networked information systems and the Internet to search for information. But often, searching for information is neither effective nor efficient. Users are frequently required to review a lengthy list of irrelevant results in order to find relevant information, and such situations often result in information anxiety (Wurman, 1989) and cognitive overload (Conklin, 1987). In recent years, numerous studies have attempted to find and to explore the causes of ineffective and inefficient searching.